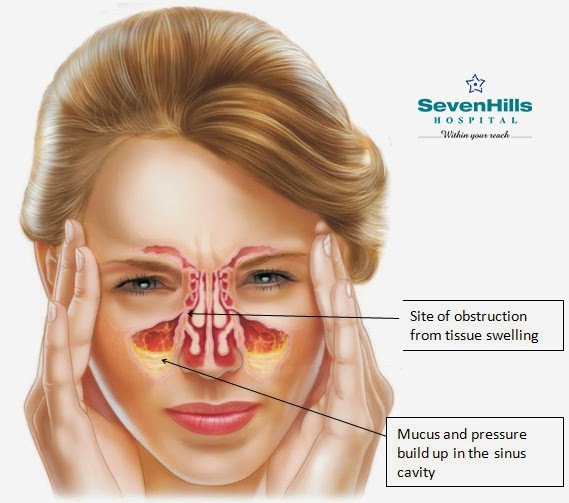 Home Body Disorders EVERYTHING ABOUT SINUSITIS YOU WANTED TO KNOW! One of the most commonly misunderstood conditions – Sinusitis, is an inflammation of the lining mucosal layer of the normally present, air containing cavities in the skull called the Para Nasal Sinuses. Depending upon the harboring skull bone, they are named accordingly – Maxillary, Ethmoids, Sphenoid and Frontal Para Nasal Sinuses. Sinusitis is further classified as Acute, Sub acute, Chronic or recurrent. 3 episodes of acute attack in a year: Recurrent Sinusitis. Extension of infection into the eye causing orbital cellulitis / abscess. Fungal super infection – mainly in immunocompromised patients – potentially lethal condition. Medical treatment is reserved for the Acute, uncomplicated Sinusitis and Allergic Rhinosinusitis. Surgical treatment is reserved for chronic conditions like Chronic Rhinosinusitis, Nasal Polyps, Deviated nasal septum, Middle turbinate Enlargement. Endoscopic Sinus surgery is the latest procedure that aims to restore as far as possible, the normal physiological status of the sinuses in the chronic sinusitis patient. A through Clinical and radiological assessment of the Sinuses are mandatory before the procedure is undertaken. This involves Diagnostic Nasal Endoscopy and CT scan of the Nose and sinuses in both vertical and horizontal plains. The endoscopic surgery is performed with the help of a telescopic – camera system through the nose. It does not cause any external Scar and can be done under local anesthesia. The principle of the surgery is to remove the disease, reestablish the sinus opening and ventilation of the sinuses. After surgery, there can be nasal packing in one or both the nostrils hence breathing has to be through the mouth. Mild ooze and soakage of the dressing can take place. Dryness of mouth and watering from the yes – both because of nasal dressing. Symptoms relating to eyes: Pain, Swelling, Double vision – has to be taken as a warning sign and should be treated as an emergency. Beware of dental infections and take dental opinion and treatment for such conditions. Avoid exposure to smoke and chemical fumes. Avoid exposure to substances that produce allergic symptoms in form of Sneezing, Itching and watering of eyes etc. – wear surgical mask while dusting etc. Avoid self medications for refractory and severe cold. If diabetic, strive for a good blood sugar control.